This group is undoubtedly the tightest of the qualifying groups, with 3 out of 4 teams still in contention. Arsenal top the group at the moment but are anything but guaranteed qualification, with not even 12 points able to guarantee qualification. Napoli sit in 2nd and Borussia Dortmund sit in third, 3 points behind Napoli. It is a big shock that Jurgen Klopp’s side are only in 3rd place but they will be looking to gain a place in the Knockout Rounds no matter what. AC Milan will secure a place in the round of 16 with a win at Celtic Park, but the trip to Glasgow will be anything but comfortable for the Rossoneri, with Celtic having won eight of their last 11 European home games. Real Madrid have pretty much guaranteed qualification but the 2nd place spot is far from secure. Galatasaray, Juventus and Copenhagen are all separated by just 1 point and all hungry for a place in the Round of 16. Juventus find themselves bottom with 3 points from 4 games but Copenhagen and Galatasaray are both within touching distance of Vecchia Signora. After what many view as an unsuccessful international break for England, the Barclays Premier League is back and what a game to start it all up again. 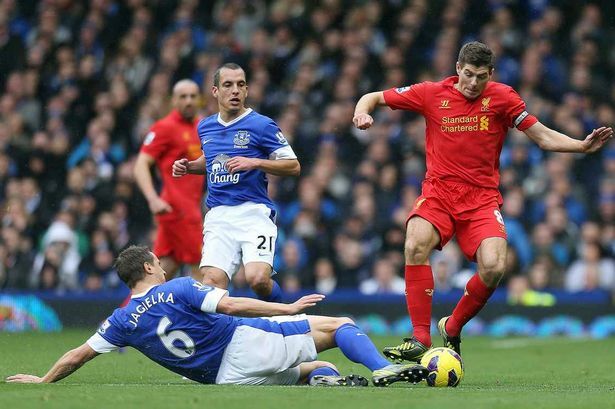 The early kick off is none other than the Merseyside derby, Liverpool vs Everton. Liverpool will travel to Goodison Park to face rivals Everton at 12:45. Everton manager Roberto Martinez has described the game as, “as good as a game of football can get.” Whilst Liverpool manager Brendan Rogers spoke about the derby saying that,”Both teams are up there and it’s credit to the players and the staff.” Everton have received eight red cards in the last 12 Goodison derbies meanwhile Liverpool have only received one. Liverpool normally come off better in these matches however it wouldn’t be a shock result if Everton won. I think that as good as SAS are, Everton are an extremely difficult team to beat, especially at Goodison Park so I think that Everton will concede first but then score and stay solid afterwards to hold out for a draw. The first African side to secure qualification was Nigeria, who managed a 4-1 aggregate victory over Ethiopia. Then followed Ivory Coast and Cameroon, both scoring 4 goals overall to see off Senegal and Tunisia respectively. Tuesday 19th November saw Algeria and Ghana qualify when Algeria went through on away goals after a 3-3 aggregate draw with Burkina Faso, and Ghana win 7-3 on aggregate to defeat Egypt. There is much doubt already that these teams will cause too much trouble, but come 12th June 2014 the West African nations will not be letting anyone have it easy. All Asian teams had qualified by June 2013, ages before the rest. Japan became the first nation to qualify for the World Cup (apart from hosts Brazil) after they won their group rather easily. Then followed Iran, Australia and South Korea. Jordan defeated Uzbekistan in a play-off, but were easily defeated by Uruguay and did not progress to Brazil 2014. This confederation has the largest number of teams qualified with 13 nations representing Europe at the World Cup. The biggest shock is the fact that Bosnia-Herzegovina qualified, but with the likes of Edin Dzeko it was never impossible. The Netherlands and Italy were the first European nations to qualify for the World Cup after securing top spot in their groups by 10th September. After them Belgium, Switzerland, Germany, Russia, Bosnia, England and Spain qualified when they won their groups. Portugal overcame Sweden in a tense 4-2 aggregate win while France, Greece and Croatia won their play-offs to put those 4 sides through. The USA, Costa Rica and Honduras all qualified as the top three of the final CONCACAF group. America and Costa Rica both secured 1st and 2nd on 10th September leaving Mexico and Honduras battling out for third. After a 2-2 draw with Jamaica Honduras took the final automatic qualification spot and therefore Mexico needed to play an intercontinental play-off against New Zealand. A whooping 9-3 aggregate win was more than enough to send El Tricolor through to Brazil 2014. New Zealand completed the Oceanic qualifying stages with no real difficulty but needed to face a tough Mexico side in an intercontinental play-off. This Mexico side really did turn out to be tough and the scoreline suggested this: 9-3 on aggregate. Sadly, no one will be representing Oceania at the World Cup next year. 4 years before qualifying even started, Brazil were announced as the first team to ‘qualify’ for the World Cup as they were chosen as hosts. 6 years and a couple months later Argentina were guaranteed a top 4 finish in the CONMEBOL group and with this came tickets to World Cup 2014. Few weeks later Colombia, Chile and Ecuador qualified, leaving Uruguay out of the top four. This meant that they would face Jordan in an intercontinental play-off, much like how New Zealand had to face Mexico. The match ended a few moments ago with Uruguay securing qualification and tickets for the very short trip to Brazil much to the despair of the Jordan team. So there we have a roundup of who’s qualified for the 2014 FIFA World Cup and some of the unfortunate nations who were knocked out. 207 teams from 6 FIFA Confederations took part in a total of 816 games and finally it has been narrowed down to the last 32. 203 days await the start of the tournament; a time to cut down teams and pin down the best tactics and players. It will be a nervy 7 months for both the managers and the players but until 12th June 2014 all we can do is wait and wait and wait…. A strong line up as England try to get into a rhythm playing together again as they prepare to play Germany the next week.